The Baja California peninsula is home to more than 600,000 North Americans and is visited annually by millions people from around the world. 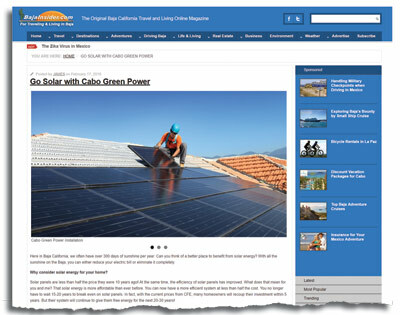 The BajaInsider.com provides an effective media outlet for your company to connect with people interested in living or traveling the Baja peninsula or Mexico. The BajaInsider is not just a website, but an electronic magazine with a worldwide distribution of authoritative information concerning culture, lifestyles, business, geography, activities and adventures of the Baja California Peninsula. Our unique mix of informational articles and Content Advertising entertains, educates, and sells. Our presence online since 2003 and continual work on our search engine visibility has made the BajaInsider an internet power tool for our sponsors and you will find many of our stories ranking in the top 10 in Google. Your sponsored page on the BajaInsider will index quickly and be a linking benefit to the ranking of your own site. Since our beginning in 2003, we have followed the adage that first-hand information is the best, and you will find a large number of our articles have been submitted by our readers. We also encourage our Sponsors to provide their unique perspective on living and traveling on the Baja peninsula, along with their advertising message. 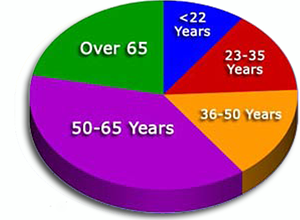 Our content includes timeless information along with breaking events and current information. The BajaInsider is created here in Baja, and as such, e provide a clear and undistorted view of what living, traveling and doing business in Baja is really all about. In 2015 we completed a major redesign of the BajaInsider making the site mobile friendly, with a fresh new look, with larger graphics and a content management system that expanded our search engine visibility. Since making that change our readership has more than doubled. BajaInsider is an informational internet advertising platform for business seeking to expand their reach those with the special interests of living and traveling Baja. Whether your product is in Baja or would be useful to folks who have an interest in living or traveling in Baja, we can help you to reach them. A majority of our Sponsors start receiving results in the first 48hrs and a link from our site to yours can improve your site's search engine ranking. In many cases, the BajaInsider's site weight and ranking will get your message indexed by the search engines faster and can rank higher than your own site in search engines. 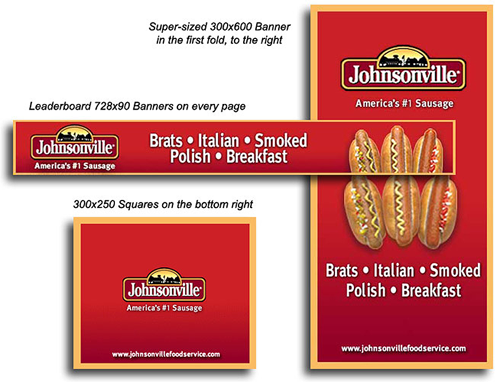 Banner Advertising, for a budget minded or branding promotion. Content Advertising, our most effective advertising tool includes full page content, Insider Update inclusion, and banner advertising. Our Content Advertising provides you space and flexibility to tell the whole story of your business, with up to 1000 words, photos, and even video. When a potential customer clicks through to your site they are more informed and pre-qualified for you to close the sale. Getting results for our Sponsors is our focus, and if we determined your campaign is not getting the kind of response had we hoped for, we can adjust the volume, change the content, banner design, message, and frequency of appearance in the BajaInsider Updates. This is something print publications just can't do. We highly recommend our Sponsors submit new content on a regular basis to take advantage of our magazine style format. Banner advertising is included in Content Advertising packages, and our clients receive about 10,000 ad views per month. Banner advertising is also available separately to Sponsors with a more limited budget or looking to establish branding. Our Content Advertising clients receive 10%-17% of their BajaInsider referred site traffic from banner advertising. Our Insider Updates are a potent tool for our Sponsors, putting leaders to their Sponsored information, new stories and tropical weather alerts in the inbox of almost 10,000 subscribers. BajaInsider Updates deliver far better results than a direct email campaign, with more than 80% open rate – That is FOUR TIMES industry standards for travel or lifestyle direct email. Promotion of stories and current events through our daily entries in our social media outlets expands the reach of your advertising through increased site traffic. Our Facebook page attracts readers to the site with teasers on informational stories, current events, and sponsored articles. According to our recent readership survey and website statistics, we can provide our Sponsors a means to shape their publicity to maximize their advertising budget. Our editorial commitment to accuracy and first-hand information has resulted in 96% of our readers rating us as a "highly reliable source of information". 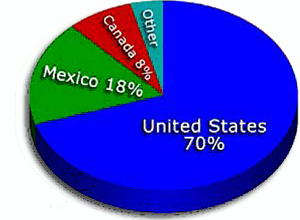 Our read ship is worldwide, the bulk of our site traffic comes from the western United States and from Mexico. These are the people that are most likely to visit Baja and become your customers. For our Travel and Real Estate Sponsors, this allows you to put your product in front of potential customers before they arrive and are swarmed by your competition. For our Lifestyle Sponsors, there are no more cost-effective means to reach North Americans living in Baja and Mexico than BajaInsider.com. More than 75% of our readers are not only good potential customers but the best kind of customer – one that returns time and again. 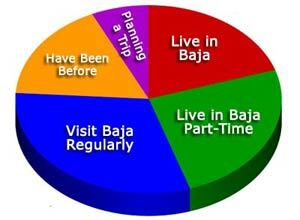 More than just one time tourists, 75% of our readers spend at least part of the year in Baja. The BajaInsider is also an effective media for reaching those with interests in international travel, environment, adventure and outdoor activities. Many Baja lovers discovered the peninsula in their youth, through surfing, fishing and just plain soaking up the tropical weather. But as the Baja peninsula grew up so did those travelers and today they represent a valuable customer demographic for your business. Many of those earlier Baja explorers have grown up and are no longer traveling on a budget, their buying power can bring growth to your business. 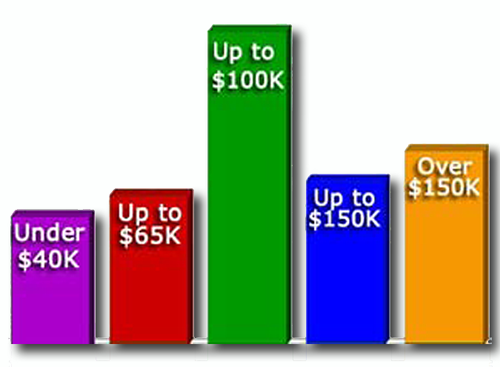 More than 75% of our readers stated to have a family income of over $100,000 per year. Our readership knows Baja, but they may not know about your business. From real estate to home furnishings, from contractors to durable goods, we can help you can make more people aware of your product or services, usually for less per month than what you might pay for a 5 word Google Adwords or classified advertising. 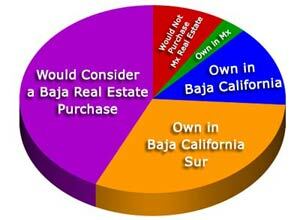 For those marketing real estate, a whopping 44% of our readers would consider purchasing a home or property in Baja. That is about 2000 opportunities a day to make a sale. 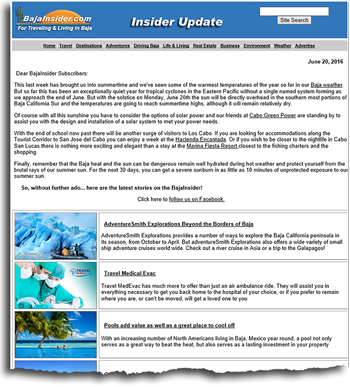 BajaInsider reaches readers while they are planning their vacation. More than 80% of our surveyed readers indicate they make some or all of their travel plans before leaving home. That means street sales and local print publications can only bring you the small faction of travelers that did not plan ahead. Our mobile compatibility makes the use of smartphones while traveling another source for travelers. 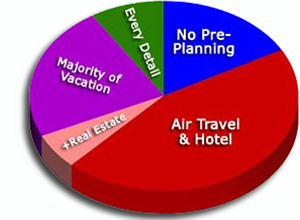 Of those making Air and Hotel reservations for Baja travel, 4% also plan to view real estate on vacation. As any advertising professional will tell you, saturation is the key to success – it is part of the reason why our minimum advertising agreement is 90 days. 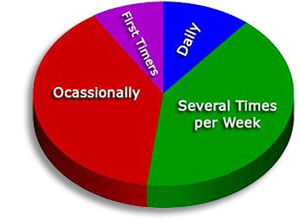 Statistics show that it takes a series of seven direct emails to gain a customer response. It takes more than 100 banner views to get a click. The vast majority of BajaInsider readers are repeat visitors who check out new articles on each visit. Let's make one of them yours.